There are many different varieties of suman. I chose to make 2 different kinds- Suman sa Ibus and Suman sa Inantala. I love this filipino dessert not just because of its sweet rice taste and chewy, soft texture but because of its unique and beautiful presentation. The glutinous rice can be rolled in different shapes with the banana leaves. The cooking part of the recipe is simple but the preparation is time-consuming. For both recipes you must soak the rice overnight or for 8-10 hours. After soaking the rice overnight, drain and rinse the rice with water. Add each batch of rice to its own stock pot. Add the coconut milk and salt. Leave the lid on and cook on low-medium heat for 2 hours. Avoid lifting the lid off. To prepare the banana leaves, rinse each leaf with water and dry. Top side of the banana leaf. Notice the ridges are raised. The bottom part of the banana leaf. Notice the smoothness. Place each individual leaf (bottom side facing the burner) over the burner on low-medium heat and wait for the entire leaf to soften and wilt. You will notice the area on the banana leaf become more opaque in a few seconds. You must move the whole banana leaf so every spot is softened. This process is to prevent the banana leaf from breaking when you wrap it around the rice. After cooking the underside of each banana leaf you want to cut away the central rib of the leaf, as shown below. Save the central ribs because you will be using those as ties. Layer the smaller leaf on top of the bigger leaf. Add about 2 tbs of rice in the center. Roll the top part of the banana leaf over to the bottom. Fold the bottom part over. Fold the right and left sides towards the center. Take another already rolled suman and place each opening side towards each other. Then use the central rib as a tie to keep the two sumans together. The final step is to steam the suman for 20 more minutes over low-medium flame. 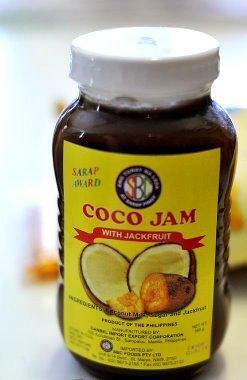 Optional: When eating the suman, you may use coco jam as a topping or freshly grated coconut and brown sugar.